With the fact that from time to time it is useful to carry out food unloading, everyone agrees. Here we will discuss only how to do it better. The reason for the unloading day may be a desire to improve your well-being, get rid of the symptoms of an incipient illness (flu, cold, jumped up pressure, headache, etc. ), bring yourself to a better form (get rid of swelling, bulging stomach) or just start to lose weight . Fasting day will help you to abandon "harmful" foods or habits and go on a reasonable diet. Finally, the fasting day is the first step in the development of interval feeding. If you decide to spend one day without food, you need to prepare for it. Even if a person missed breakfast, lunch and dinner, this does not at all mean that he is starving all day. The state of health and the effect of the unloading day as a whole depend on the preparation. If you decide to start in the morning, this is the wrong choice, because gastric juice has already appeared in your stomach and you are hungry. In the small intestine is previously eaten food (yesterday), in the large intestine - waste, and in the gallbladder - bile, waiting for a new portion of food. First you need to deal with this, otherwise abstinence will turn into a painful self-deception. The day before fasting, thus, live and eat, as usual, but in the evening, 2-3 hours after dinner, you should start preparing for a fasting day. Tubage (blind sensing) - for the liver and gallbladder. Taking a laxative - to remove food debris and waste from the intestines. The choice of pharmacy is important. It is difficult to say in advance which one is better. If you have no experience, we recommend using magnesia (MgSO4 - magnesium sulphate in powder) for both tubing and laxative. In total, it will need 50 grams (2 sachets or 2 cans of 25 grams each). You can try other means (see below), but it is better to start with magnesia. The heating pad can be used both electric and water. The gallbladder is an organ the size of a chicken egg (50 ml), which receives 1.5 liters of bile per day. 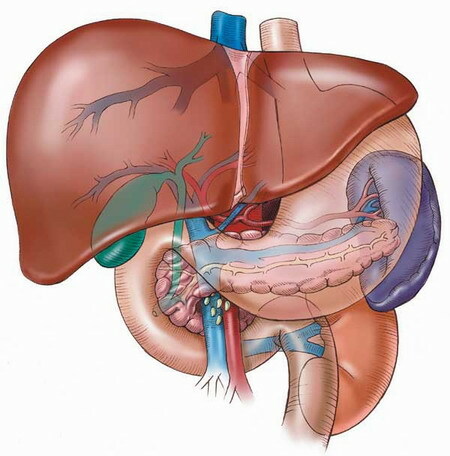 The purpose of the gallbladder is the thickening of bile and its timely delivery into the intestine. The clarity of his work depends on the functions of purification and digestion of the body. Bile is needed for the absorption of fat, but also with the bile, the liver gets rid of toxins and metabolic products. If a problem occurs with the removal of bile, not only digestion suffers, but the whole body also suffers. One of the most frequent problems of a fasting day is an overflowing gallbladder. With regular meals, the gallbladder works “by meal hours”. If the food does not arrive on time, it is overfilled and creates problems, therefore the tubing, also called blind sounding, must always precede the discharge day. When the gallbladder is not emptied, a person experiences a headache, dry mouth, nausea, pain in the right hypochondrium, weakness, palpitations, blood pressure can rise and jaundice appears. These are signs of intoxication, showing that the products excreted by the liver have not left the gallbladder and are again in the blood. Sometimes, if the release of bile does not occur in a timely manner, it may not get into the intestines, but into the stomach and esophagus. In this case, there are bloating and pain in the abdomen, belching with air, heartburn, bitter taste in the mouth, and a brown patina on the tongue. Another consequence of the "inoperative" emptying of the gallbladder is constipation. Untimely or incomplete emptying of the gallbladder is called biliary dyskinesia. Stagnation of bile in the gallbladder leads to its chronic thickening and the formation of stones, that is, gallstone disease. Stagnation of bile in the gallbladder leads to its chronic thickening and the formation of stones, it is a gallstone disease. With the stagnation of bile, unpleasant changes occur in the gallbladder wall: inflammation, induration, thickening, edema, polypous growths, etc. An infection sticks to an unhealthy organ, which is called cholecystitis. The outflow of bile with it is hampered even more, and if the harmful factors are not eliminated, everything ends with the removal of the gallbladder, the most popular method in the world for its “treatment”. You can spend tubage in the morning on an empty stomach or at any time of the day, but not earlier than 2-3 hours after eating. It usually takes 1-2 hours to empty the gallbladder. Sequence of. Drink 1 cup of rosehip infusion or 1 dessert spoon of “Holosas” diluted in a glass of hot water. After 10-20 minutes, proceed to the tuba. On the area of the liver (recall that the liver is located not in the stomach, but behind the ribs, in women - under the breast) put a heating pad. The temperature is not very high (42-430C) so that it warms, but does not burn. Dilute in a glass of hot water 10 grams (2 teaspoons) of magnesium sulfate powder, drink this solution in 4 divided doses of 50 ml, with an interval of 15 minutes. You can drink through the tube, so as not to irritate the taste. In the glass, you can add ½ teaspoon of citric acid or juice from half a lemon. Magnesium sulfate also occurs in capsules and granules. If you are lucky to get one, the procedure will require the same 10 grams - 40 capsules of 0.25 grams each. In Europe, Canada, USA magnesium sulfate is produced under the name Epsom Salt. Warming up lasts 1-2 hours. If during this time there is no “rumbling” in the intestines and there is no urge to use the toilet, it is recommended to do several exercises (see below) and extend the warming up for another half hour. In some diseases, doctors do not recommend warming up the internal organs. You can replace warming up with energetic charging or jogging. There is, however, one inconvenience: a successful tubage may end in a sharp urge, so be prepared to quickly get to the toilet. Exercise 1. Walking around the room, first normal, then with a high lifting of the thigh. Run for 30–40 seconds. Breathing alternates: for 2-3 steps - inhale, 3-4-5-6 steps - exhale. Уexercise 2. Stand with your legs wider than your shoulders. Raise your hands up - inhale, 2-3-4 springy tilt forward, trying to reach the floor with your hands - exhale. Repeat 6-8 times. Exercise 3. Stand up, putting his feet on the width of the foot. Open your arms to the side - inhale, 2-3-4, with your hands on your knees, make springy squats - exhale. Repeat 6-8 times. Exercise 4. Stand up, feet shoulder-width apart. Make a turn with the body to the right, extending and hands to the right - inhale, bulging the abdomen, turning the body to the left - exhaling, pulling in the belly. Exercise 5. Lying on your back, put your hands along your torso. Raise your hands up - inhale, tighten your left knee to your chest with your hands - exhale. Lower the leg, and hands again raise up - inhale. Tighten the right knee to the stomach with your hands - exhale. Repeat 4-5 times. Exercise 6. Lying on your back, bend your legs. Raising the chest and head, hands to get his knees - exhale. Repeat 6-8 times. Exercise 7. Lying on the right side, put the right hand under the head, and the left on the stomach, legs bent. Perform diaphragmatic breathing. When inhaling, bulging the abdomen, bending slightly in the lower back, while exhaling, retract the stomach, making the back round. Repeat 8-10 times, then lie on the other side and do the same. Exercise 8. Kneel, brushes resting on the floor. Sit on the right heel, taking the left foot back, inhale (do not tear off the hands from the floor). Slide the left knee between your hands and lay the stomach on the left thigh - exhale. Do the same with the other leg. Repeat 3-5 times. Exercise 9. The starting position is the same as in the previous exercise. Bend back and then bend, as cats do. Exercise 10. The starting position is the same as in the previous one. Raise your right hand up to the side - inhale, clasping her chest, bend down and reach the floor with your right shoulder, slightly turning the body to the right - exhale. Same other shoulder. Repeat 3-5 times. Exercise 11. Kneeling, spread your arms to the side - inhale, bulging the abdomen, tilt the torso forward, and arms back - exhale, pulling in the abdomen. Repeat 6-8 times. Exercise 12. Lying on your back, legs bent, hands put on the stomach, elbows lowered. Perform abdominal breathing, 8-12 movements. In some cases, with a particularly "lazy" gall bladder, you can feel nothing by spending an hour or more on tubage. In this case, you should eat 1 chicken egg, or 5 quail. If you trust the manufacturer, drink raw - but it is better to cook them. The person has a special reflex of “emergency evacuation” of bile, which allows to release the gallbladder, the gag reflex. They have all the babies, burping with overeating. Any intoxication or poisoning is accompanied by nausea - preparation for vomiting - and this is normal, but due to education over the years, we diligently suppress this reflex, so that overeating and poisoning remain "unpunished." If it is not possible to release the gall bladder with tubage, you need to use a backup option. The realization of the reflex is divided into two types. There is vomiting in which it “turns it inside out”, a chore, hiccups, and vile (acid and bile) in the mouth — we don’t need that. And there is regurgitation, like in young children with overeating, which release the stomach and fall asleep - that is worth learning. Technique of. Take a liter jar, fill with water at room temperature. Throw on the tongue half a teaspoon of baking soda and quickly drink the water as much as possible (usually contains 700-800 ml). Empty the stomach only by standing, leaning over the toilet or other capacity. Put one hand on the lower abdomen, and with two fingers of the other hand gently tap the root of the tongue, as if inviting the stomach to take part in the regurgitation. As soon as the first wave goes, with your hand on your stomach, push it upwards, also gently. Also with each wave until the stomach is completely free. The whole process takes 2-3 minutes. When the stomach becomes empty, relief comes immediately, and the gallbladder dumps bile into the intestine. Warning! If you have never tried to wrest from your own will, do not be too zealous! Drunk water does not go back - not scary, it will come out with urine. If “to tear up the tongue”, capillary hemorrhages on the face may occur, the whites of the eyes turn red, and an attack of hypertension can happen - a pleasant little. In order to clear not only the large intestine from waste, but also thin from the remnants of food, not every laxative will do. This explains the choice of magnesia. The remaining 40 grams of powder should be diluted in a glass of hot water until completely dissolved, allow the solution to cool, and then drink it in one gulp. It is easier to do this in two steps, dividing the solution into two glasses of 100 grams. Finally rinse your mouth or drink clean water. At this active action over. It remains to wait for the “penetrating” effect, visit the toilet several times and go to bed. Desires, as a rule, begin in 1,5 - 2 hours and last about an hour. You should not lie at this time or drink plenty of water, since both of them delay the bowel release process. Due to the nature of magnesia, the feeling of hunger does not appear soon after its intake; that is why sulphate mineral waters are so popular among those who want to "lose weight". When you wake up on a “day without food,” you need to remember what you can and cannot do. There can be no food, but you can have tea or coffee (but without milk and sugar). You can sugar substitute (in tablets). You can not juice and sweet drinks. There are no restrictions on water. Motor mode is active, with no need to fear weakness, it will not. Bath, sauna, sports - all this is possible. Having washed, drink tea or coffee, then take a shower (preferably a contrast), drenching hands and feet with cold water. Do exercise. Now you will surely feel hungry. The first rule of proper fasting - do not go hungry! A simple exercise that allows you to eliminate the feeling of hunger in 1-2 minutes is called “Jasper frog drives the waves” and is performed as follows. You need to rest your palms on a chair or a low table. Take a deep breath while pulling in the belly. Hold your breath for 3-4 seconds. Exhale, relaxing the stomach. Repeat the exercise 10 times. After a minute or two, the feeling of hunger will disappear. This exercise can be done differently. Put your palms on your stomach. Take a deep breath, while pulling the belly. Hold your breath for 3-4 seconds. Exhale while relaxing your belly. Repeat the exercise 10 times. Exercise is effective in standing, sitting and walking; helps a little in a prone position. Hands are used simply for control. Perform it whenever there is a feeling of hunger. In some cases it makes sense to drink 100-150 grams of alkaline water before the exercise (Essentuki No. 17, Polyana Kvasova, Luzhanskaya). Usually “a day without food” is calm and does not require any special effort. You can cook, try food, be present at the table - just do not eat! For this, do not forget about the "jasper frog chasing the waves." On this day it is also useful to hold a tubage - at any time, with any of the means indicated in the table. This tubage is special in that it is carried out "on an empty stomach", because, unlike the first, "preparatory" tubage, the procedure will not end with a "rumbling" in the stomach and urges. Upon completion of the procedure is to take fiber (simple bran or fiber from the pharmacy). Take 2 tablespoons of plant fiber, pour it with a glass of water, stir and drink. Cellulose allows you to "bind" toxins and metabolites in the intestine, preventing them from being absorbed. In the morning it is found that the weight has decreased by 1.5 - 2 kg, and the state of health is good, and this feeling should not be spoiled by overeating. Breakfast should be simple and, preferably, without easily digestible carbohydrates, which include all cereals, bread, potatoes, sweets, sweet fruits and jam from them, fruit juices. These products are not only quickly absorbed, increasing blood sugar, but also rapidly excreted, causing a feeling of hunger. It is advisable to prepare for breakfast products of animal origin: meat, fish, poultry, seafood, eggs, cottage cheese, cheese, cheese. Raw vegetables, which can replace fermented and salted in winter, are excellent for them. Sprouted seeds, nuts and berries are also good. On this day, you can leave the usual, three meals a day, but you can try to give up lunch or breakfast. And of course, you should not additionally eat. If you learned the Frog, it is not difficult. In the evening, we recommend to take 2 tablespoons of plant fiber, which will help to restore normal stools. One or two days fasting is completely harmless. It can be carried out regularly - for example, every week. Such fasting does not guarantee a significant weight loss or cure for diseases, but it allows you to improve your well-being and to organize your diet correctly. Do not risk independently starving for a long time, not knowing who is responsible for it. It is better to learn and do it right. Magnesium sulfate in powder (Epsom Salt). Dose of 5-10 grams (1-2 teaspoons) for 200-300 ml., Water. Plus - acts on everyone, sometimes requires a large dose or warm-up time. Minus - an unpleasant taste. Hunyadi Janos. Almost the same as magnesium sulphate, but also contains Na2SO4). The solution in the bottle concentration of 30%. For tubage, use 30 ml of H.J., diluting it in 200 ml of water. H.Y. can be used as a laxative. It requires 150 ml of H.I. dilute in equal amounts of water and drink. Sorbitol. A dose of 15-30 grams (1-2 tablespoons) per 200-300 ml of water. The action is average. Plus - sweet taste. Minus - fermentation and rumbling in the intestines, which can continue the next day. At bedtime, take 4 grams of charcoal (20 tablets). Mineral water. Essentuki №17, Borjomi, Polyana Kvasova, Luzhanskaya №4. Plus - taste good. The action is soft. Minus - warming up time, 1.5 hours - 2. The effect may not occur. This means that the choice of means for tubing was wrong. Magnesium sulfate. 40-50 grams diluted in a glass of water. To reduce the unpleasant taste and accelerate the "penetrating" effect, add 1 teaspoon of citric acid (powder) to the solution. Drink and after 2-3 minutes, take 1 teaspoon of baking soda, washed down with water. Plus - always works. The reaction after 1.5 - 2 hours. Minus - nasty taste. Fortrans. Powder bag. Dilute 1 sachet in 1 liter of water, drink 1 glass every 10 minutes. Plus - tolerant taste. Minus - to get the "piercing" effect you need to spend 4 hours.